A Hurricane Warning means that hurricane conditions are expected within the warning area within the next 36 hours. Preparations to protect life and property should be rushed to completion. 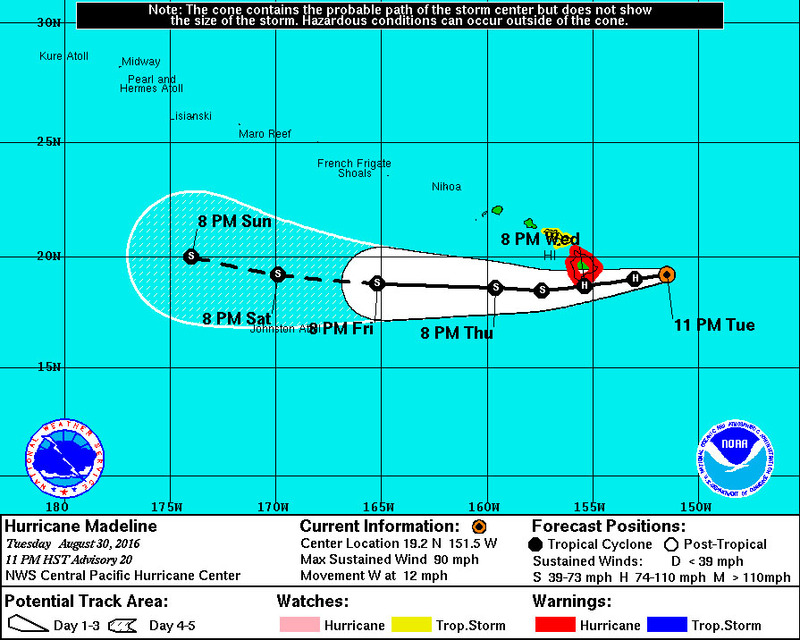 Interests elsewhere in the main Hawaiian Islands should monitor the progress of Madeline. At 11 p.m. HST Tuesday (Aug 30), the center of Hurricane Madeline was located about 235 miles (380 km) east of Hilo, Hawaii. Madeline is moving toward the west near 12 mph (19 km/h) and this motion is expected to continue for the next couple of days. WIND: Hurricane conditions are expected to develop over Hawaii County as early as late Wednesday and continue into early Thursday. Tropical storm conditions are possible over Maui County, including the islands of Maui Molokai Lanai and Kahoolawe, late Wednesday into early Thursday. SURF: Swells generated by Madeline are expected to build from east to west across the Hawaiian Islands through tonight, possibly becoming damaging along east facing shorelines of Hawaii County and eastern portions of the Island of Maui Wednesday into Thursday. RAIN: Heavy rains associated with Madeline are expected to reach Hawaii County on Wednesday, and may impact other Hawaiian Islands later Wednesday through Thursday. Madeline is expected to produce total rain accumulations of 5 to 10 inches across Hawaii County, with isolated maximum amounts near 15 inches, especially over windward portions. Madeline may produce total rainfall of 1 to 3 inches, with isolated maximum amounts up to 4 inches, across Maui County. This rainfall may lead to dangerous flash floods and mudslides. STORM SURGE: Depending on the track of Madeline, the combination of storm surge and tides could cause normally dry areas near the coast to become flooded. The water could reach 1 to 3 feet above ground if peak surge were to coincide with high tide. The surge would be accompanied by large damaging surf and can vary over short distances. At 11 p.m. HST Tuesday (Aug 30), the eye of Hurricane Lester was located about 1,160 miles (1,865 km) east of Hilo, Hawaii. 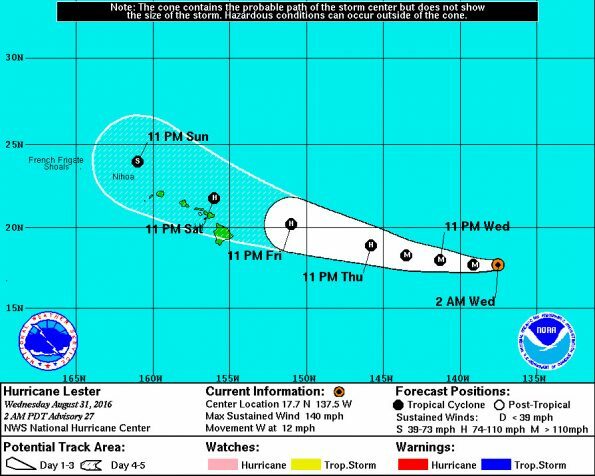 Lester is moving toward the west near 12 mph (19 km/h). The hurricanes should move toward the west or west-northwest at about the same forward speed over the next two days. Maximum sustained winds are near 140 mph (220 km/h) with higher gusts. Lester is a category 4 hurricane on the Saffir-Simpson Hurricane Wind Scale. 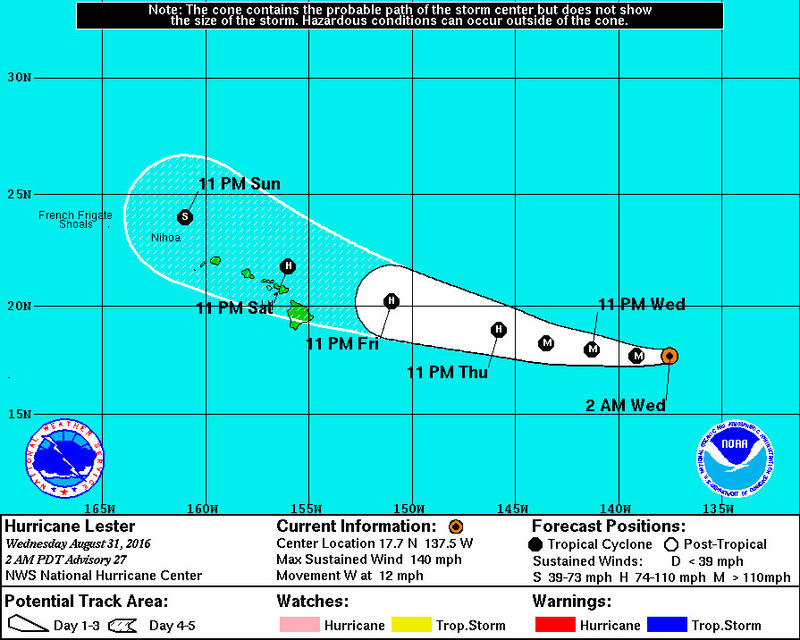 Some weakening is forecast during the next 48 hours, though Lester is anticipated to remain a strong hurricane. Hurricane-force winds extend outward up to 35 miles (55 km) from the center and tropical-storm-force winds extend outward up to 90 miles (150 km). National Weather Service Presentation on Hurricanes. Include a flashlight with fresh batteries, cash, first aid supplies, and any medication or supplies specific to you or your family members. Plan how to communicate with family members. Create an evacuation plan for your household. Bring in or secure outdoor furniture and other items that could blow away. To help preserve water availability through the storm, the Department of Water Supply asks customers to minimize non-essential use of water, such as irrigation, at this time.